ePosters - WHAT IS THE BEST SCIENTIFIC JUSTIFICATION FOR MPAS ON CARIBBEAN REEFS? 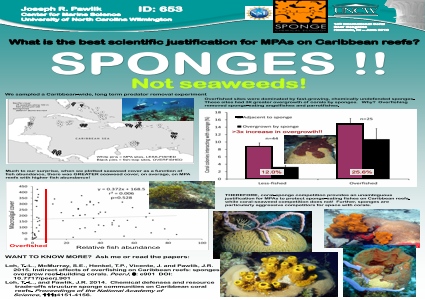 Poster Title: WHAT IS THE BEST SCIENTIFIC JUSTIFICATION FOR MPAS ON CARIBBEAN REEFS? Abstract: Marine protected areas (MPAs) are a common policy tool used for the conservation of coral reefs worldwide. The scientific justification for MPAs is based on community-level indirect effects of overfishing on the competitive interactions between seaweeds and reef-building corals: more fishing, more seaweeds, less coral. Some have questioned this justification for MPAs in the Caribbean, which has reefs that are distinct from those found elsewhere in the tropics. We found an explicit indirect effect of overfishing on competition between sponges and reef-building corals from surveys of 69 sites across the Caribbean. Removal of sponge-eating angelfishes and parrotfishes resulted in > 3 fold increase in overgrowth of corals by sponges, with coral-sponge contact increasing from 11.0% to 25.6%, and these sponges were mostly species palatable to sponge predators. Palatable sponge species have faster rates of growth or reproduction than defended species, which instead make metabolically expensive chemical defenses. Surprisingly, overfished sites had lower seaweed cover, contrary to prevailing assumptions about seaweed control by herbivorous fishes. Coral-sponge competition provides an unambiguous justification for MPAs in the Caribbean, while seaweed cover does not.Summary: What is the best scientific justification for MPAs on Caribbean reefs? SPONGES!References: Loh, T.-L., McMurray, S.E., Henkel, T.P., Vicente, J. and Pawlik, J.R.